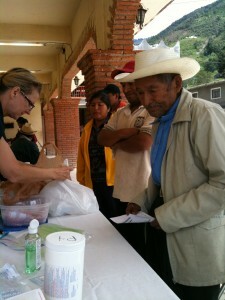 If you volunteer with ARMONÍA, what kind of work is involved? centers means helping teach and tutor children, supporting the ARMONÍA staff in their leadership of the center, helping with meals and cleaning, playing sports and games, and participating in their worship celebrations on Sunday. Your participation will also depend on the current needs in the centers and your personal skills and gifts. 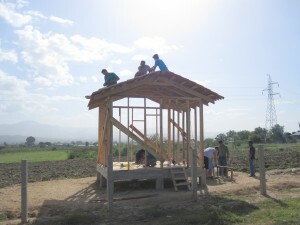 Volunteers also have the opportunity to contribute to various construction projects, especially in Oaxaca, where a new students residence is being built to house students participating in the ARMONÍA Indigenous Mexican Scholars (AIMS) program. In addition to Oaxaca, there are often construction projects in Mexico City in which volunteers may have the opportunity to participate. Daily maintenance is also an area in which all volunteers are involved at some point. This includes painting, helping to move furniture, and helping with the cleaning of working areas. An essential part of ARMONÍA’s community center ministry is attending to the health of people in the community and in the surrounding neighborhoods. Health clinics are held in all three community centers toward the end of August and early September, offering a variety of medical and dental assistance. When the world uses the celebration of the birth of the Son of God among us mainly for self-gratification, you can make a difference. Christmas is a time to participate with Saul and Pilar Cruz, local ARMONÍA staff and many other Christian friends from different parts of the world in stimulating conversations about the responsibilities and possibilities for involvement with the poor as the Body of Christ. The Christmas Experience at ARMONÍA takes a minimum of six days, and it is a group experience. Four large community meals are served at the different Transformation Centers with the participation and work of all visitors. The activities for visitors and locals are varied and are suitable for all members of a family: from children to grandparents! We give bread and a chicken for each family, and the warm clothing for the children and the elderly make a big difference. Service and mercy with a big smile point to the real meaning of Christmas and give hope of God’s presence with them. ARMONÍA’s walk alongside the poor allows all of us to experience the joy of generosity. Thanks to the generosity of many of you, the ARMONÍA Christmas Project distributes every year hundreds of jackets, jumpers and warm clothing to the neediest children who attend our community centers and hundreds of dinners for many needy families to enjoy a Christmas dinner. 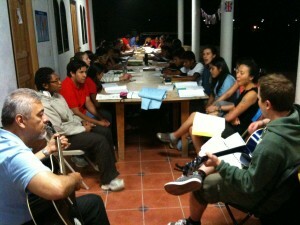 Periodically, Saul Cruz teaches a Transformation Course that trains and equips visitors for kingdom service. The length of the course varies from one to two weeks, and covers a variety of topics from biblical studies to analysis of culture. Several volunteers have enjoyed participating in this course while also having opportunity to experience various aspects of ARMONÍA’s work in the community centers or construction projects. If you are interested in participating in this course, please email us to inquire about the dates for upcoming courses. This is an area where our volunteers learn to assist us in tasks such as replying to e-mails related to different projects and areas of ARMONÍA; do proof reading; make preparations for teams to arrive; and help with the making of new materials. It is an intense and important area, that requires good judgment and discipline. The volunteer involved in this area will always combine it with others tasks such as teaching at the Transformation Centers and maintenance activities when needed. 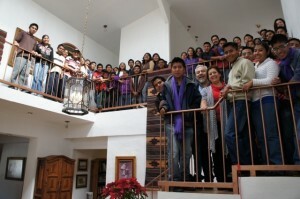 Volunteers usually live and share daily life with students in the ARMONÍA residence. This includes general tasks of helping with cooking, cleaning, general maintenance of the house. You will also participate in frequently reading the Bible together. It is the hope of ARMONÍA that you develop lasting relationships while you participate in daily Christian community with these students.